Glasscock Log & Lumber is one of the largest producers of aromatic red cedar lumber in the United States. We specialize in producing aromatic red cedar cants. We are known world wide as one of the leading export suppliers of red cedar cants. 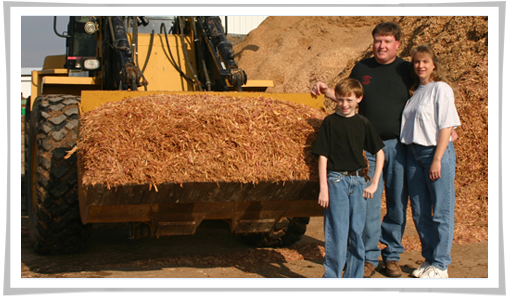 We are also known for our high quality aromatic red cedar mulch. Whether it is aromatic red cedar cants or mulch that you are looking for, you have come to the right place. We at Glasscock Log & Lumber are known for supplying the buyer with only quality products delivered on time and at a fair price. Mark Glasscock grew up in the sawmill business. His father owned a sawmill for several years. He quit briefly to become the county judge in Spencer County and then returned to the industry. "I was brought up in a sawmill," Glasscock said. As an adult, Glasscock cut hardwood timber, but it was seasonal work, he said. Looking for a year-round job, Glasscock decided to open his own sawmill. At the time, Glasscock and his wife Karen lived in Spencer County. A drive down Springfield Road in Nelson County one day started to put all of the Glasscocks' dreams into motion. The property seemed perfect for a sawmill, Glasscock said. There was no sign indicating who owned the plot of land at 2870 Springfield Road or whether or not it was for sale, Glasscock said. But, after a little leg work, the Glasscocks found out who owned the property and later purchased it and relocated to Bloomfield. Sixteen years ago the Glasscocks opened Glasscock Log and Lumber, Inc. At that time they had only one employee. "We put a lot of prayer and thought into our business," Glasscock said. Over the years the business has grown from one sawmill with one employee to two sawmills, a band resaw, a mulch machine and 12 employees. It just really shot up. It has really grown," Glasscock said. The business specializes in cedar wood - Aromatic Cedar - a red, fragrant type of cedar wood. Aromatic cedar is the type of cedar used in shavings and cedar chests, he said. Over the years the business has really grown It is one of the largest red cedar sawmills in America. Glasscock's cedar products are shipped all across the world. Our biggest customers are in Asia. "It's huge," Glasscock said. He estimates the company produces about about 25,000 yards of cedar mulch annually. Glasscock said many people prefer the cedar mulch to the hardwood mulch because it is naturally insect resistant; it holds moisture and heat in the ground; it protects plants; and smells and looks good. Cedar mulch is a longer lasting mulch than the hardwood, he said. "It was really important to us for our business to look good so Nelson county would be proud of it," Glasscock said. "We wanted something the community would be proud of," he added. The Glasscocks said the entire county has welcomed them and their business with open arms. Glasscock said he welcomes everyone to stop by and see what the business has to offer. For additional information call 502-252-9408.